When you watch Elementary Season 4 Episode 11 online, Captain Gregson requests Sherlock's assistance on behalf of a colleague from the Narcotics division. Captain Lombardi wants Sherlock to stage the perfect heist from the fortified lair of a violent, drug-dealing biker gang. Specifically, they need to discover if the gang's financial information and other evidence are on the gang leader's computer before they raid the place with a small army. Before Sherlock can do more than formulate a plan, however, the undercover officer who had infiltrated the gang is found shot to death. A number of bizarre clues point to an even stranger string of events that leaves the investigators scratching their heads. Meanwhile, autistic programmer Fiona asks Joan for her assistance, and Joan realizes that Sherlock actually likes Fiona, and maybe possibly something more. Will Sherlock and the team figure out what happened to Detective Dunning? What was the truth behind the murder? Because there is definitely more than meets the eye in this case. And how will Joan react when she realizes that Sherlock gave Fiona a first edition book of cat poems by T.S. Eliot? 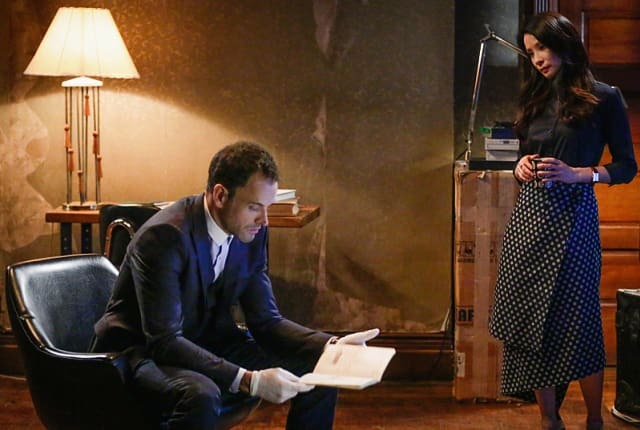 Find out what happens when you watch Elementary Season 4 Episode 11 online! You want to steal something from a heavily-armed, meth-dealing band of bike-riding Satanists. Permalink: You want to steal something from a heavily-armed, meth-dealing band of bike-riding Satanists. [about a violent biker gang] Well, they spared no expense embracing the cliches, haven't they? Permalink: Well, they spared no expense embracing the cliches, haven't they?